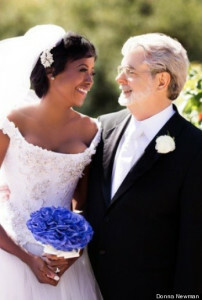 George Lucas and Mellody Hobson are now husband and wife. Lucas 69 , is the famed Hollywood writer, director and producer, best known for the Star Wars film franchise. Hobson, 44, is president of Chicago-based Ariel Investments and sits on numerous corporate boards. The power couple were married north of San Francisco on June 22nd at Skywalker Ranch. Reportedly , journalist Bill Moyers officiated, and former New Jersey Sen. Bill Bradley walked Hobson down the aisle.